We have a helpless romantic attitude towards our past. As history unfolded across the globe, heroes rose and fell. Some to be remembered and some to be forgotten by the violent waves of passing ages and citizens of the cultures in the world. We do remember her! She was martyr and a fierce warrior and most certainly, one of the most awe inspiring characters to have ever walked the earth. We humbly present to you Joan of Arc. 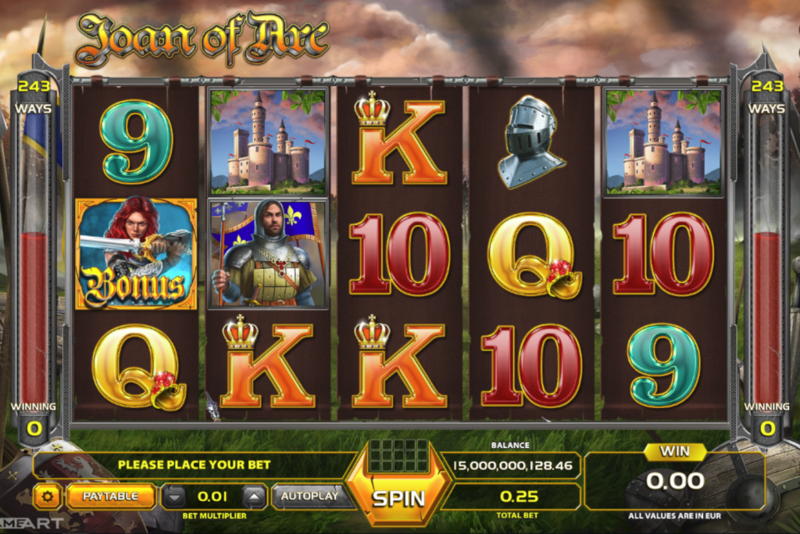 Be sure to fight your way in the ranks of The Maid of Orleans in this 243 way historical game of honour and luck! We present to you our newest system of Expand & split. This feature will randomly replace and split symbols on the wheels as the symbols with arrow borders will expand when triggered by scatter symbols. 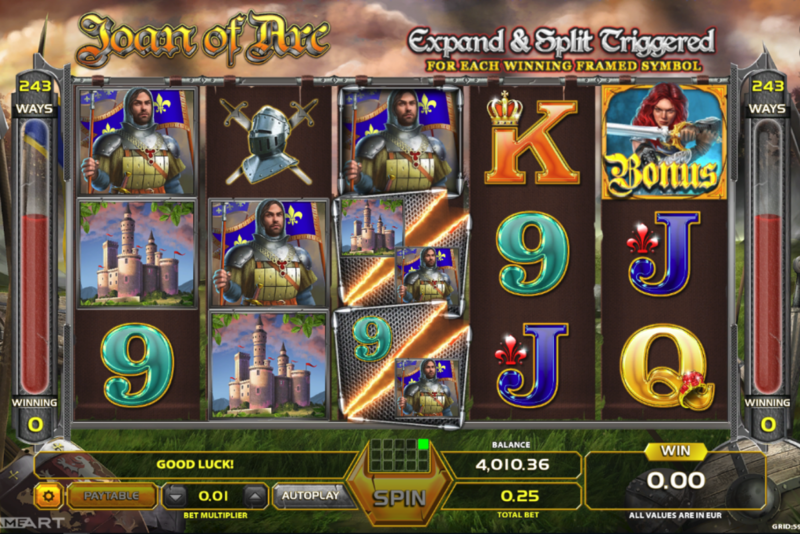 Note that the Scatters are triggered by 3 or more scattering arrows of fire on any position, awarding 10 freespins that can of course be retriggered with holy fury! If you feel like fighting for a higher win with our heroine, be sure to enabled the gamble feature to have the possibility to double your wins! Aim high with those flaming arrows! 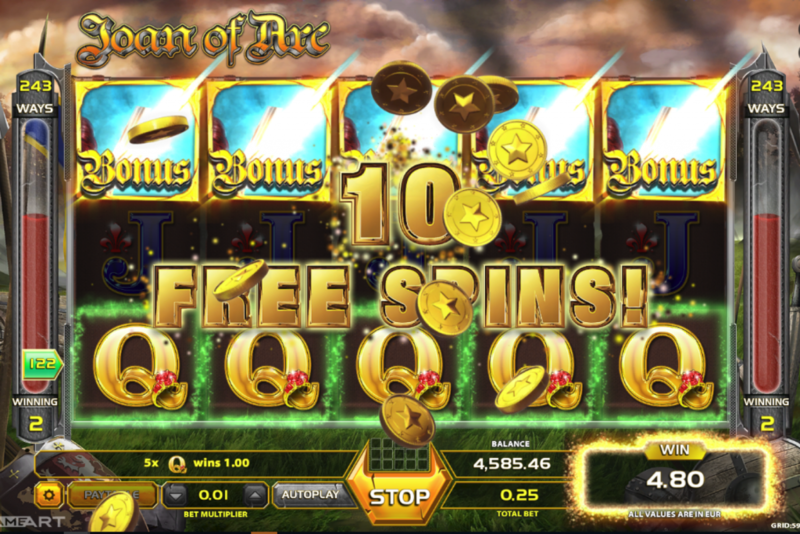 This is a game of historical magnitude that is going to give you countless hours of lucky wins and charging free spins. Join the ranks of the Maid of Orleans and lay a siege of success and glory in the game of Joan of Arc, never to be forgotten!